Exploration and settlement of the western United States by Americans and Europeans wreaked havoc on the Native Americans whose history dates back thousands of years. 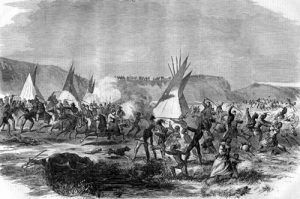 In the 19th century, western expansion of the United States clashed violently with the Native Americans who wished to preserve their lands, sovereignty, and ways of life. The struggle over frontier land erupted in numerous Indian Wars and skirmishes in the 1860s and 1870s. In 1865 a congressional committee began a study of the Indian uprisings and wars in the West, resulting in a “Report on the Condition of the Indian Tribes,” which was released in 1867. This study led to an act to establish an Indian Peace Commission to end the wars and prevent future Indian conflicts. 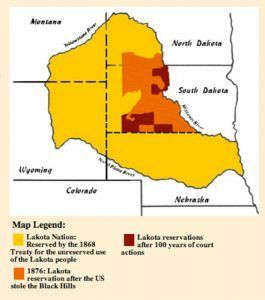 The United States government set out to establish a series of Indian treaties that would force the Indians to give up their lands and move further west onto reservations. In the spring of 1868 a conference was held at Fort Laramie, Wyoming, that resulted in a treaty with the Sioux, which was to bring peace between the whites and the Sioux who agreed to settle within the Black Hills reservation in Dakota Territory. The Black Hills are sacred to the Sioux and in the 1868 Fort Laramie Treaty, the United States recognized the Black Hills as part of the Great Sioux Reservation and the land was set aside for exclusive use by the Sioux people. In 1874; however, General George A. Custer led an expedition into the Black Hills accompanied by miners who were seeking gold. Once gold was found in the Black Hills, prospectors quickly moved on to the Sioux’ sacred land by the thousands. Before long, the miners and settlers began to demand protection from the United States Army, who was ordered to move against wandering bands of Sioux hunting on the range in accordance with their treaty rights. In 1876, Custer, leading an army detachment, encountered the encampment of Sioux and Cheyenne at the Little Bighorn River. Custer’s detachment was annihilated, but the United States would continue its battle against the Sioux in the Black Hills until the government confiscated the land in 1877. To this day, ownership of the Black Hills remains the subject of a legal dispute between the U.S. Government and the Sioux. General William T. Sherman and Commissioners in Council with Indian Chiefs at Fort Laramie, Wyoming, 1868. Articles of a treaty made and concluded by and between Lieutenant General William T. Sherman, General William S. Harney, General Alfred H. Terry, General C. C,. Augur, J. 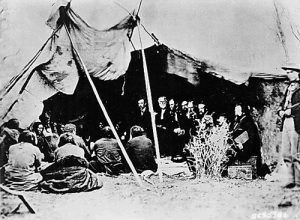 B. Henderson, Nathaniel G. Taylor, John B. Sanborn, and Samuel F. Tappan, duly appointed commissioners on the part of the United States, and the different bands of the Sioux Nation of Indians, by their chiefs and head-men, whose names are hereto subscribed, they being duly authorized to act in the premises. From this day forward all war between the parties to this agreement shall forever cease. The Government of the United States desires peace, and its honor is hereby pledged to keep it. The Indians desire peace, and they now pledge their honor to maintain it. If bad men among the whites, or among other people subject to the authority of the United States, shall commit any wrong upon the person or property of the Indians, the United States will, upon proof made to the agent and forwarded to the Commissioner of Indian Affairs at Washington City, proceed at once to cause the offender to be arrested and punished according to the laws of the United States, and also reimburse the injured person for the loss sustained. If bad men among the Indians shall commit a wrong or depredation upon the person or property of any one, white, black, or Indian, subject to the authority of the United States, and at peace therewith, the Indians herein named solemnly agree that they will, upon proof made to their agent and notice by him, deliver up the wrong-doer to the United States, to be tried and punished according to its laws; and in case they willfully refuse so to do, the person injured shall be reimbursed for his loss from the annuities or other moneys due or to become due to them under this or other treaties made with the United States. And the President, on advising with the Commissioner of Indian Affairs, shall prescribe such rules and regulations for ascertaining damages under the provisions of this Article as in his judgment may be proper. But no one sustaining loss while violating the provisions of this treaty or the laws of the United States shall be reimbursed therefore. The United States agrees that the following district of country, to wit, viz: commencing on the east bank of the Missouri River where the forty-sixth parallel of north latitude crosses the same, thence along low-water mark down said east bank to a point opposite where the northern line of the State of Nebraska strikes the river, thence west across said river, and along the northern line of Nebraska to the one hundred and fourth degree of longitude west from Greenwich, thence north on said meridian to a point where the forty-sixth parallel of north latitude intercepts the same, thence due east along said parallel to the place of beginning; and in addition thereto, all existing reservations on the east bank of said river shall be, and the same is, set apart for the absolute and undisturbed use and occupation of the Indians herein named, and for such other friendly tribes or individual Indians as from time to time they may be willing, with the consent of the United States, to admit amongst them; and the United States now solemnly agrees that no persons except those herein designated and authorized so to do, and except such officers, agents, and employees of the Government as may be authorized to enter upon Indian reservations in discharge of duties enjoined by law, shall ever be permitted to pass over, settle upon, or reside in the territory described in this Article, or in such territory as may be added to this reservation for the use of said Indians, and henceforth they will and do hereby relinquish all claims or right in and to any portion of the United States or Territories, except such as is embraced within the limits aforesaid, and except as hereinafter provided. If it should appear from actual survey or other satisfactory examination of said tract of land that it contains less than one hundred and sixty acres of tillable land for each person who, at the time, may be authorized to reside on it under the provisions of this treaty, and a very considerable number of such persons shall be disposed to commence cultivating the soil as farmers, the United States agrees to set apart, for the use of said Indians, as herein provided, such additional quantity of arable land, adjoining to said reservation, or as near to the same as it can be obtained, as may be required to provide the necessary amount.